BOBBY VALENTINE Discord with GM? The division of the Red Sox isn’t limited to Saturday’s split-squad games against the Miami Marlins and Philadelphia Phillies. 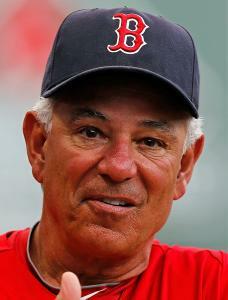 A wedge appears to be forming between new manager Bobby Valentine and new general manager Ben Cherington on the best way to employ Daniel Bard, starter or reliever, and the best place to employ shortstop prospect Jose Iglesias, Fenway Park or Pawtucket. Valentine reportedly told scouts from outside the Sox organization he wants Iglesias, not utilityman Mike Aviles, as his starting shortstop. The Sox manager believes Iglesias is ready to play in the majors, which runs counter to the organization’s belief that Iglesias, who is batting .200 this spring with one extra-base hit, is greener than Fenway’s fabled Wall with the bat. Valentine has been lukewarm, bordering on openly cynical about Bard’s conversion from setup man to starter, a centerpiece of Cherington’s team-building blueprint, and a report, citing an anonymous Sox staffer, said Bard would be returning to the bullpen when the games begin for real. We have the first sign of discord in this shotgun marriage. Whose evaluation wins out, Valentine’s or Cherington’s, is going to signal how the Sox are going to be run and who wields the power in baseball operations. The Sox can talk about collaborative processes and multifactorial reviews all they want, but at the end of the day someone gets the final say. Don’t forget that Cherington didn’t choose Valentine. He was foisted upon him by Sox president and CEO Larry Lucchino, the man who runs the Red Sox, after ownership was underwhelmed by Cherington’s choice of onetime Sox third base coach Dale Sveum. Ownership did to Sveum what he used to do to Sox base runners - sent him home without a chance. Disagreements between a manager and a general manager happen all the time. Terry Francona and Theo Epstein had them. They’re inherent to the jobs. Managers, on a shorter leash and timeline for success, tend to look at the short term. What can help them win right now? General managers, charged with having a vision for sustained success and prone to basking in their own planning, often take a more long-term view. But what makes this one different is that it could define the influence that each man has in the Sox decision-making hierarchy and who has the ear of Lucchino. When Epstein was here, it was clear the team worshipped at the altar of the GM’s office. Francona’s job was to manage personalities, which until last year he did brilliantly, and to execute the overall plan that Carmine the Computer and Co., devised. Valentine is not that type of manager, which was why his hiring was a bit of a surprise. Thus far, Valentine has been everything we expected him to be - engaging, energetic, outspoken, entertaining, and cunning. He is a man of bold ideas and uncommon self-assuredness, so much so that he regards his own observations about the game and players as facts, not opinions. Lest you accuse him of being a bit too critical of his players this spring in games that amount to practice. If Cherington is a disciple of Moneyball, Valentine’s baseball philosophy could be summed up as Bobby Knows Best. During his last managerial stint with the Chiba Lotte Marines in Japan, Valentine had authority that extended well beyond that of a typical manager, as revealed in a 2007 Sports Illustrated profile. He chose the roster, hired executives and, in typical Bobby V fashion, designed the uniforms. Yes, the Marines wore Valentine, not to be confused with Valentino. He had total control, and he won. After it took Valentine nearly 10 years to get another major league managerial job and the Sox handed him only a two-year deal with a pair of club options, he’s going to do everything possible to make sure he puts himself in the best position to succeed in what is probably his last, best chance to be a big league manager. Truthfully, that would mean Iglesias, who has more range than a Prius, at short and Bard, who remains a two-pitch pitcher, buttressing Andrew Bailey and Mark Melancon at the back of the bullpen. Nothing short-circuits a team faster than bad defense and an untrustworthy bullpen. Word of the differing views about Bard and Iglesias going public is Bobby looking out for Bobby. If he doesn’t get his way, and Bard struggles in the rotation or the bullpen is so bad it needs to be fumigated, or Aviles starts channeling Edgar Renteria, he has it on record that these failings aren’t his fault. Disagreeing with his GM is nothing new for Valentine. In 2000, Valentine made an infamous appearance at the University of Pennsylvania’s Wharton School of Business, where he was critical of some of the decisions of Mets general manager Steve Phillips, whom he feuded with in New York. Sometimes the gap Valentine creates is the one that contains his tongue. But disagreement isn’t necessarily a bad thing, as long as there is compromise. Hopefully, Valentine and Cherington can bridge the gap better than Valentine and Phillips. Playing in baseball’s toughest division and coming off their hardball Hindenburg finish to last season, the last thing the Sox need is a power struggle between the two men entrusted with putting the faith back in Fenway Faithful.